In honour of the Play Dough Pledge that The Imagination Tree, Nurturestore and Sun Hats and Wellie Boots are doing this week I’m featuring some dough posts from last weeks link up – not all play dough but dough of some sort or the other. 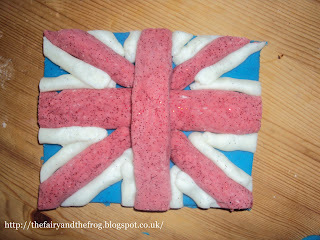 First off this Union Jack Playdough from The Fairy and the Frog – how great is this – can see us making this in the lead up the Olympic Games. 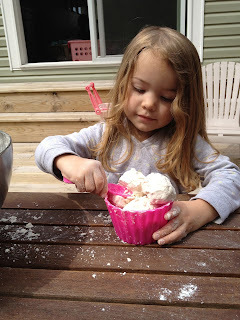 These cloud dough cupcakes from Busy Hands, Blessed Hearts including some extra real ingredients look so much fun and really messy – just like we like things in the Rainy Day house. These amazing sandpits full of the wonderful cloud dough is by a new to me blog Timeless Adventures that I’m really enjoying now I’ve discovered it. If you have been featured please feel free to grab our Featured at Tuesday Tots on Rainy Day Mum badge from the sidebar and display it on your blog. I’m loving all the play dough recipes this week! So inspiring.